If your insurance company has totaled your car or you have an old vehicle that doesn’t run in your driveway, you may still be able to get some money out of it. 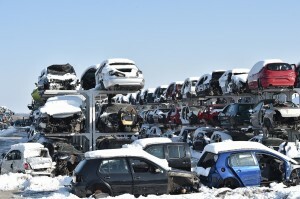 Some people don’t contact salvage yards to sell their cars because of myths surrounding them. Here are some things you may believe about salvage yards that just aren’t true. Salvage yards have been called “junkyards” in the past, which lead to believing that there is only junk in them. While the cars may not run, the parts in them are still usable, and depending on the type of accident and when it occurred, many parts are like new. These aren’t junk parts, but ways to save money and help the environment. Most salvage yards are kept safe for employees and visitors. You won’t be in danger when you need to look for a part. Even better, many yards are inventoried and set up to make finding a part easy for the management. You can pay a little more and get the part you need quicker! Salvage yards accept all types of vehicles, not just those made in America. If you need parts for your car from Japan, Korea, or elsewhere, you can probably find them at a salvage yard for much less. This also means they will buy your foreign make! When a vehicle is sold to a car salvage yard in Florida, it’s at the end of its life and worth only a few hundred dollars. There’s no reason for anyone to haggle over the price. You might compare salvage yards and what they offer, but haggling is not a part of the business model. However, most salvage yards are ready to offer free towing from your location because it makes business sense for them to do so.